Yesterday I un-mothballed both my Vespa GT 200L and the Mrs’ Buddy 125 for a kickoff run after petrol and compressed air. Glorious! The weather was just the cool side of perfect and surprisingly the roads are virtually free of sand and grit here in our part of the Twin Cities. I was apprehensive at first, having been three months out of the saddle for winter, but soon the feel and rhythm of riding my gorgeous little italian beast came back to me as though I’d never left my seat. I’ll be heading the GT in for its 500 mile service today at Scooterville and I hope they won’t need to keep him long. Otherwise I’m very grateful to have a 40-60 city mpg transportation option in a time when saving money is so important. 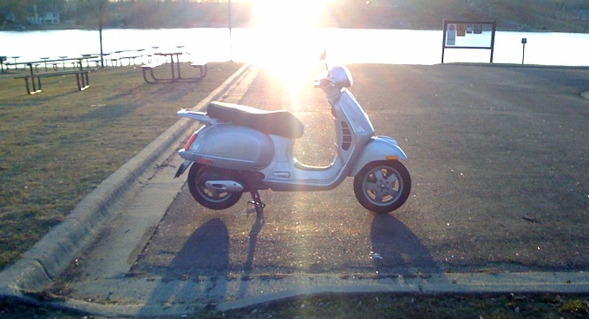 Viva la Vespa! Yay! Let’s hope the 10 day forecast is wrong and we’ll get a ride soon. I assume you mean weather.com’s 10-day forecast and let me assure you that they’re really conservative. My Dashboard Weather widget, for example, doesn’t show any rain through Monday.